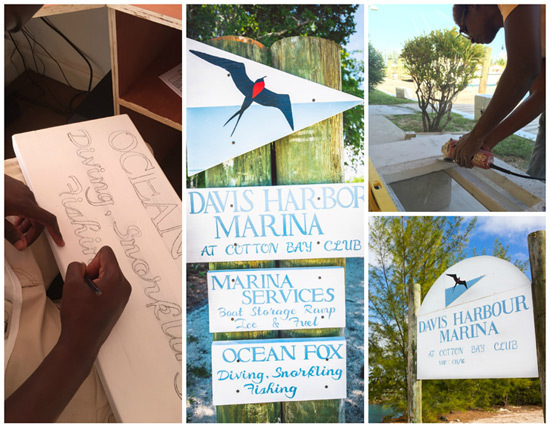 (Eleuthera, Bahamas) – Aspiring artists in South Eleuthera are contributing to the revitalization of Davis Harbour Marina. From the moment you enter the property, either by boat from the Exuma Sound or by car from Queens Hwy, “you are going to notice a personal and authentic touch to the property”, says the Marina’s Harbour Master, Jeremiah Sweeting. Davis Harbour Marina at Cotton Bay Club, between the settlements of Waterford and Wyemss Bight in South Eleuthera, has begun making investments in the property in the off-season. The team’s idea is simple: create authentic experiences around the property through the participation by the local art community. “Art makes you feel good. It connects us to others and brings out emotion. Especially Bahamian art; it is vibrant, thoughtful and practical in every manner,” says Robert Fortson, the ownership group’s representative for Davis Harbour. In the early months of planning for the Marina upgrades, signage was a noticeable and immediate need. Instead of looking outside of the Davis Harbour team, Jeremiah shared with Robert the artistic talents of a Marina dock attendant, Patrick Wright. Today, Patrick, a resident of Green Castle, has completed two entry signs around the property that showcase Patrick’s natural talent as an artist. Patrick built and finalized the entry sign off of Queens Hwy by incorporating a traditional pillar concept that subtly expresses a sense of arrival, similar to concrete pillars at entry points in already established communities around Eleuthera such as Cotton Bay and Windemere Island. Instead of utilizing concrete, the entry pillars at Davis Harbour have a nautical twist and are built from marina pilings that traditionally are used around the docks. Patrick has also recently made the finishing touches to a larger entry sign welcoming boaters from the Exuma Sound. The second phase of signage Patrick will design, build and create includes directional and identification signage throughout the property. “People want to be welcomed when entering the Marina no matter if they are a repeat captain, a new guest to the Marina or a staff member arriving daily. The arrival experience at Davis Harbour is an extension of true Bahamian hospitality; welcoming and warm from the moment you enter the Marina,” Robert notes. As Patrick shares, “I take Robert’s vision for the Marina’s signage and create the design on paper utilizing the new Davis Harbour logo as a benchmark. From the design, I don’t just paint a 2×4 and write a few words on it and nail it to a post. I instead shape the wood materials to create a natural look in the sign by cutting arches and layering certain features of the logo to bring out dimension and volume in the sign; features a computer-designed sign can not replicate.” The personal touches are truly expressed as Patrick takes his time to draw and paint each letter from a pre-scribed font used within the Marina’s new logo. “The end product is thoughtful and authentic signage for all our friends of the Marina. We find the gesture to be socially responsible to our community and a cost savings to our business by not having to engage multiple companies to design, print, and ship in a generic sign from Nassau or beyond.” says Jeremiah. Shorlette Francis, a Rock Sound resident and established artist in her own right, has added a few personal touches to the Marina renovations with new vanities in each of the Marina washrooms. An experienced artist over the years, Shorolete creates function through her masonry work by taking a traditional Bahamian concrete vanity and adding recycled glass bottles and jars as well as local seashells to the concrete pour. She then grinds the vanity to establish a clean, polished surface and seals it. “Art is beauty but can also be functional and practical. I incorporate these features of use and enjoyment in my creations,” Shorlette shares. With the addition of a new “sea-to-table” restaurant coming to Davis Harbour Marina in early 2016, the Marina team wanted to also showcase local artists as restaurant and Marina patrons strolled around the Marina docks. The Marina will be displaying within in its Harbour House local “for-sale” artwork by Ron Horton of Rock Sound, Trippoli Burrows of Govenors Harbour and Julius Rankine of Savannah Sound as well as Shorlette Francis.